10 meters (33’) diameter is the maximum size of a round earthbag structure before needing buttressing. This design features two large bedrooms with spacious closets, efficient kitchen and loft for home office or 3rd bedroom. The inner circular wall is built of recycled brick for strength and rustic effect. 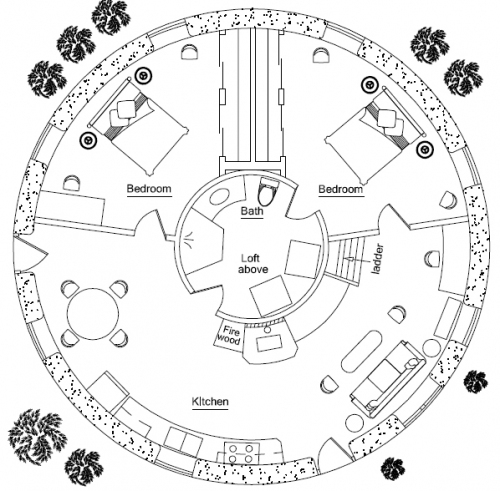 The loft has a 3′ circular skylight and a knee wall with view to main living space on first floor. 855 sq. ft. interior plus 91 sq. 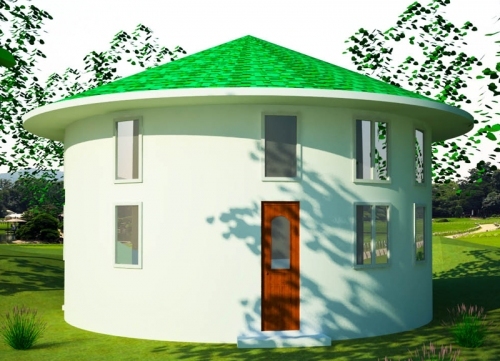 ft. loft; 2 bedroom, 1 bath with laundry; footprint: 36′ diameter. Hi there, In one of the above comments you state that the loft is above the two bedrooms and bathroom. I would put that at somewhere around 450 square feet more or less. Is that right? If that is not what the plans show, any reason why that could not be the footprint of the upstairs? The description says: 855 sq. ft. interior plus 91 sq. ft. loft. That should be correct. Is it possible to make a second floor of this house using timber-framed strawbale to reduce the weight of the house? I love the floor plans, but I really would love a big attic. I love the ground floor layout. I cannot tell how large the loft is – is a whole floor or just the area above the bathroom? The loft is above the center core plus the bedrooms. I really love all of your designs. I have been jumping from one to another trying to decide which design best suits my needs (heavy snowfall area, first time builder, a desire to extend the structure at a later date). I thought I read that the walls should not be over 10 feet tall. Is this true? earthbags for just below the highest side of the shed roof? Or would you use another material for this section of the walls? Also, what considerations do you have to account for if you plan on expanding a structure at a later date? For example, an exterior wall on the first structure would likely become an interior wall after you add on to the original structure. I’m glad to hear you are thinking things through carefully. It’s not unusual to spend a year or more on planning to make sure you get it right. Wall height: You can add a bond beam at 8′-10′ height and continue adding more bags after the concrete dries. You can use almost any type of roof you want, including shed roofs. You’ll see photos of some like this on our blog and other websites. Shed roofs in general are the easiest to build. However, the round shape makes them a little tricky. One option is to use a center pole and put rafters that radiant out from the center. Or you can use TJIs and do long spans. I love 1.5 Story Roundhouse and the land I would like to build on is in Barbados. I have to get official permission first but before I even open that conversation up I wondered if you knew someone who is skilled in building according to your plans and whom has built in the Caribbean? I have surfed the net for a couple of days now and I’m not finding anything. I am a completely new to all this natural housebuilding and while I very much want to be part of the process – and save money as well – I feel I need to hire some kind of expert to guide me. Really I need someone who knows how to source materials in Barbados and is aware of the very special and wonderful weather. I assume you are very well-networked and I thought you would be the one to ask. I also wondered how much it might cost to build 1.5 Story Roundhouse? I’m absolutely in love with these roundhouse plans. Do you know of any difficulties/complications that may arise from combining the look of the single story roundhouse (with only one bedroom) with the decked out roof on top of this 1.5 Story roundhouse? Couldn’t we extend the height of the center loft to go up to center of deck? Also, we have 4 growing boys and desperately need a pantry to the side of kitchen. Would this work under side stairs leading up to deck on the kitchen side of the home? I am in the Austin area and cannot get my hands on enough plan details of these earthbag roundhouses. Thank you very much for all of your time you have contributed in helping so may others. You can make all sorts of changes such as those you’ve asked about. The options are pretty much unlimited. I provide basic plans to show some possibilities and point people in the right directions. 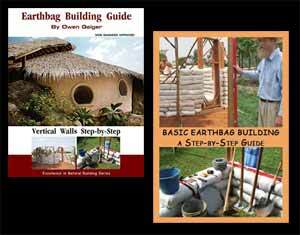 We have thousands of pages of free information, including free earthbag videos that show every step, Instructables that explain every step, etc. Everything you need is free. Or you can buy my ebook and DVD that consolidate all the most important information to speed the learning process. i just paid for the 1.5 story round house plans how do i access the plans?? We send by email. The first batch has already been sent.